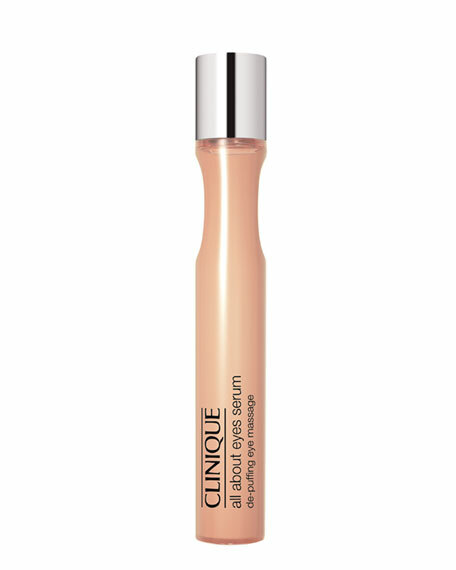 Named "Best Eye Cream for Depuffing" for Allure magazine's "Best of Beauty" (October 2011 issue, p.234). This instantly cooling serum helps massage away bags, refreshes, and hydrates puffy eyes on contact. All About Eyes Serum also brightens the eye area immediately and over time and combats dark circles with caffeine, potent antioxidants, and soothing botanicals. Layer under or over any All About Eyes formula, or with our other eye treatments or makeup. Using gentle pressure, roll under each eye from inner corner to outer corner twice. Apply morning, night, and as needed throughout the day.